A man's skin is very different from a woman's, in most cases it's oiler, the pores are larger and it's more sensitive due to the daily shaving routine, I've rounded up my top tips (with product recommendations) for the perfect shave. Ladies, listen up, man-grooming is becoming all the rage, although I am still trying to convince my husband to take the leap, he's not budging, at all! But if you have dude who like to primp and preen then read on. First off, a man's skin is very different from a woman's, in most cases it's oiler, the pores are larger and it's more sensitive due to the daily shaving routine, I've rounded up my top tips (with product recommendations) for the perfect shave. Facial whiskers on every "man face" can lead to ingrown bumps, red spots and even oozing itchy sores. The brawnier you are in the facial hair category, the heavier the punishment if you choose to shave it off regularly. Exfoliating is one of the best ways to unplug the pores of each hair follicle. By doing this at least twice a week you are helping to get rid of dead skin cells and reduce build up resulting in less ingrown hairs and blackheads. You will also get a closer shave. Choose a scrub that has natural oils in it and one that offers a deep cleanse at the same time. Product recommendation: Neil's Yard Revitalizing Face Scrub. It's packed with wild rice that energizes and gets rid of dull skin, and honey that conditions and purifies. If you want to take the pre-shave one step further you can use a lightweight blend of botanical oils, it's going to help soften the skin resulting in a closer shave. This is best used daily prior to wet or dry shaving and it worth the added step. Product recommendation:Cocoon Apothecary's new lineup of men's products called Malechemy (love the name!). They have an entire lineup of men's grooming essentials, I love their beard oils, there are four of them and they are all simply divine, if I had to choose, my top pick it would be the Muskoka Beard Oil. The argan oil has anti-inflammatory properties which can protect the skin from becoming irritated after contact with a razor blade. An essential step in the overall care of your skin. Wash your face in the morning and at night with a soap or cleanser that isn't too drying. Product recommendation:Malechemy's Cleanse Tea Tree + Aloe Vera. This is the perfect "throw-in-your-gym-bag" product for the man on the go. The Aloe Vera rich formula combined with nurturing botanical ingredients will nourish and protect your skin. Essential oils boost antioxidant power as well as infuse this product with the intelligence of the plant world. Okay guys, most of you forget or forgo this step, but it's key to having healthy skin. You want to moisturize at least twice daily and you want to pick a light weight moisturizer with superior hydrating qualities, but one that's not too thick and creamy. You want to make sure you are balancing oil production without clogging your pores. This light-as-air moisturizer is good enough to eat! But it's better on your face. A powerful blend of antioxidants and serious emollients (apricot kernel, safflower oils) help to restore and rebuild dehydrated skin. Pick a shave cream or balm that is loaded with vitamins and antioxidants. You also want to have the proper shaving techniques. This guide has been adapted by a professional barber handbook and is a must read! Product Recommendation:Aubrey Men's Stock North Woods Shave Cream. The organic Avocado Oil & Wheat Germ Oil Help your razor glide smoothly and the Camphor, Menthol & Organic Eucalyptus cool and invigorate. The Witch Hazel soothes irritation. The post-shave face has open and vulnerable pores that may be irritated and angry. It's important to use an after-shave that is gentle, balancing and calming. 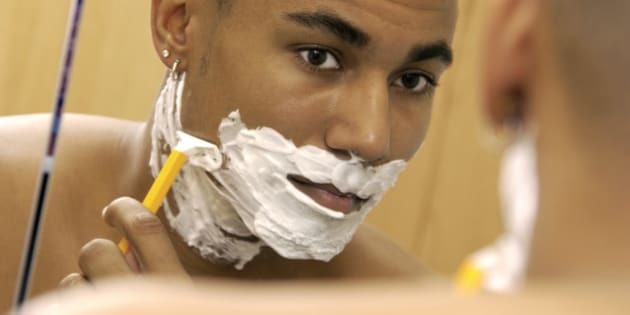 You want to make sure the after-shave you are using is helping to relieve your skin, stop the bleeding from nicks, and help them heal, soothe, prevent or minimize razor burn and ingrown hairs. Helps with clear, even skin tone, a good balm nourishes and seals roughened skin cuticles on opened exposed pores. Skin is softened and soothed, eliminating post shave inflammation and irritation. If you have sensitive skin I recommend a balm that has shea butter in it. A great choice to help calm irritated skin and heal razor burn. Look for a gel that has anti-bacterial ingredients like tea tree, it will help get rid of clogged pores. This is the most common one. Look for one with Aloe Vera, it will reduce redness and act as a skin conditioner and lotion. When choosing skincare products, make sure they are natural or organic. Not sure about how to read the labels, check out my last blog for tips.